This listing is for a white head scarf with pink flowers. Simply tie around your head. Wear to the front or side. Looks great with hair up or down. Perfect for that rockabilly style! Simply tie around your head. Wear to the front or side. Looks great with hair up or down. Perfect for that rockabilly style! The item is new and unused. New Womens Ladies Vintage Floral Print Crop Bomber Jacket Zip Up Biker Coat Top. New Fashion, Excellent Quality, Celebrity Inspired, Vintage Biker Coat, Classic Bomber Jacket, Floral Print Crop Jacket, Ribbed Cuffs And Collar, Zip Up Clouser, Brand: Janisramone, Style: Bomber Jacket, Fastening: Zip Clouser, Sleeve: Long Sleeve, Material: 95% Viscose 5% Elastane. Length: 22 Inches Approx. Garment Care: Machine Washable. Soft Comfortable Fabric. Available In SM, ML Sizes. Available In Black, Cream, Floral Print Colors. 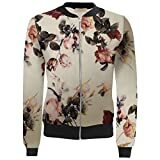 New Womens Ladies Vintage Floral Print Crop Bomber Jacket Zip Up Biker Coat Top Is Comfortable And Ideal Outwear For This Season. It Has Soft Comfortable Material, Long Sleeve, Zip Up Clouser, Excellent Quality Vintage Classic Biker Jacket, Ribbed Cuffs And Collar Various Floral Printed Celebrity Inspired Cropped Jacket Coat Which Gives Stylish Look With Black Jeans.